The HP C6119A Bulk Black Industrial Ink Cartridges Supply produces superior print quality with minimal intervention and cost.. This system brings convenience and high-quality printing to industrial markets that need a high-volume ink delivery system. HP designed the C6119A bulk ink delivery system for high-volume applications that require high-quality results, low cost per print, and infrequent ink supply intervention. 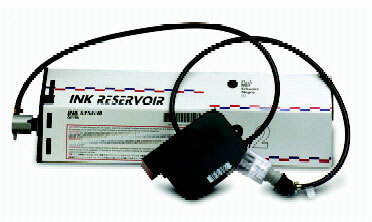 This system consists of a print cartridge and a water-resistant black ink supply, connected by a tube. It is designed to print 600 dots per inch in applications where high-quality output on porous media is required. Non-contact, drop-on-demand inkjet technology delivers reliable, quiet printing. Integrated Driver Head (IDH) technology coordinates individual nozzles through a multiplexing scheme that fires all 300 nozzles through 52 interconnect pads. The print cartridge can be snapped in and out for easy replacement, while the high-capacity bulk ink delivery system makes those replacements less frequent. The print cartridge has a thermal sense resistor, which measures temperature, and enables thermal management and burnout protection for the printhead. The HP Bulk Black Ink Supply brings convenience and high-quality printing to industrial markets that need a high-volume ink delivery system. The large ink supply and easy replacement reduce downtime, so print volume is increased. Low cost per print helps reduce production overhead. Water-resistant ink prevents bleeding and streaking on a variety of print media.